While watching The Edge of Seventeen, it stuck me how we haven’t really had a truly great teen movie this decade until now. The 80s had plenty of John Hughes films to choose from, the 90s got a few cheesy hits, and even the 00s had ones like Mean Girls and Superbad to fall back on. But when you look at this current decade, nothing really stands out as much; films like Easy A, which at the time were tons of fun, don’t especially hold up well upon re-watch, while more popular ones like The Fault In Our Stars are fine, but don’t exactly capture the actual feel of teen-dom, more so honing in on a particular subject instead. The reason I’m not counting a genuinely great teen movie from this decade, The Perks of Being a Wallflower, is because it was set in the early 90s, and when I’m talking about a great movie from this particular decade I mean one that somehow incorporates a lot of today’s mannerisms and appliances while also representing what it’s like to be a teenager today; basically, a time capsule of a movie. 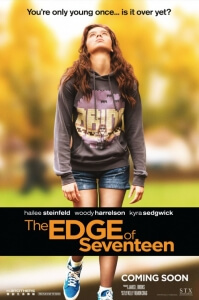 The Edge of Seventeen, an original concept by writer-director Kelly Fremon Craig, fits the description perfectly in several ways while also being an extremely poignant movie on its own, and thus draws to a thunderous conclusion the search for the first truly great pure teen movie of the 2010s. It tells the story of a teen girl named Nadine (Hailee Steinfeld), who from an early age has always been exceptionally awkward at school, and with her family. Her only beacon of light is her friendship with Krista (Haley Lu Richardson), who has helped her get through some rough patches in her increasingly strained existence, most notably a traumatising experience she went through a few years ago (and it truly is traumatising, in one of the film’s many dark moments). However, even that is jeopardised when she accidentally stumbles upon Krista in bed with Nadine’s older brother Darian (Blake Jenner), and their pursuing relationship sends Nadine down an even deeper path of depression, anxiety, and insecurity that she constantly finds more and more difficult to emerge from with her sanity still intact. It may come across as an eye-rolling series of “white middle-class teen problems”, given that she and her family live comfortably in a decent-sized house (with a pool, no less!) and are mostly good-looking souls in their own right, but the sheer genius of Craig’s script and direction is that not only are we wisely advised to overlook these aspects of their well-off life, but more importantly care about them as actual characters and not as archetypes as a lot of other teen movies this decade have tended to do. All of these characters, from Darian to Krista to the self-centred matriarch of the family (Kyra Sedgwick) to especially Nadine herself, have distinct personalities and arcs that feel real and not artificial, more than a good number of the teen movies we’ve gotten so far this decade. They refuse to be black-and-white clichés because they are written to be, as well as acted like, real people that you would actually find yourself coming across every now and then. Even older authority figures, represented most by Woody Harrelson’s sardonic and sometimes lazy teacher, don’t fall in to the trap of being there just to provide the main character with some help and guidance, they are also given plenty of moments that make them just that little bit extra more human. It helps that they are given great material to work from, as Craig’s script lends itself a wicked sense of humour as we watch this young woman go through endless moments of awkwardness, while not exactly painting her as a do-no-wrong outsider at the same time. It’s a film that is simultaneously funny, mature, heart-breaking, and even intense in some of its darker moments, all of it feeling true to life and not simply a construct of a screenwriter’s creative mind. Boosting the film towards several further heights is Steinfeld’s incredible lead performance here. The actress and recent chart-dwelling singer reaches new levels of being extraordinary here, a feat previously thought impossible after her Oscar-nominated debut in the Coen Brothers’ True Grit, by taking a character whose precocious and sometimes sociopathic behaviour may have read badly on paper as an unlikeable teen with unmined levels of narcissism about her, and making her a compelling character to watch and even root for. Steinfeld has always been an exceptional young actress, even in films that she was far too good for, but here she expertly brings to life a portrait of a sympathetic and insecure teenager that has some serious internal problems which only seem to be getting worse with every passing day of personal torment. She sells her character’s dry sense of humour and later heartfelt revelations flawlessly, and while the rest of the cast is honestly perfect in their own roles it is Steinfeld’s magnetic presence as a compelling and three-dimensional teen character, the likes of which haven’t been fully utilised since the era when John Hughes reigned supreme, that anchors the ship far across its mighty waves. It encapsulates teen strife in a modern environment so perfectly, it can even be watched many decades later as one of the greats, an accomplishment that should propel The Edge of Seventeen into the must-watch category when teen films of any kind are on the table. It’s a new modern classic of the genre, one that should gain audiences long after iPhones and Facebook are all but obsolete, and stand the test of time as one of the many great examples of teens on screen. The Edge of Seventeen is a modern teen classic, incorporating heavy themes of depression, anxiety and insecurity amongst modern teens perfectly, and anchored by an astonishing and heart-breaking lead performance by Hailee Steinfeld.